There are so many things I enjoy about my adventures, that I hardly know where to begin. I like visiting new places, but not in the way you might expect. Most travelers just want to see famous tourist sights, but I love to discover what I think of as the “hidden treasures” in a city. People look confused when I say that, thinking I mean gold, silver or jewels. Those would be nice of course, but that isn’t what I mean. For me, “hidden treasures” are the things that people living in the city think are ordinary and boring, but I find truly amazing. For instance, I was surprised when I saw a bear on the street in Berlin, but I could hardly believe it when I saw that he had a map of Berlin on his coat. It was when I looked closely at the map that I spotted the hidden treasure. I expected the map on the bear’s coat to have streets, and buildings, but I didn’t expect it to show the exact bear I was looking at. That one still makes my head hurt, but the people from Berlin didn’t even notice. I enjoy tasting new food, or an old favourite prepared in an unusual way. 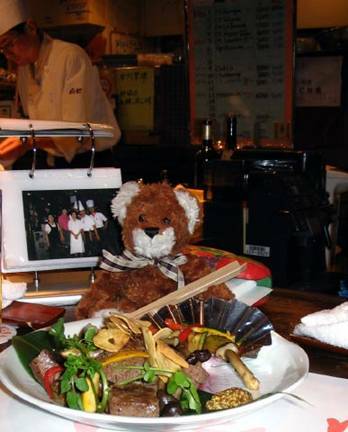 The first time I visited Japan, I was thrilled to see the Japanese eating raw fish. Bears are often disturbed when I tell them that people ruin perfectly good fish by cooking it. I knew I would like Sushi and Sashimi as soon as I saw that the fish was raw, but the only reason I tried it with soy sauce and wasabi, was to be polite. I was amazed to discover just how tasty it was. My bear friends are still sceptical about wasabi, but I love it, and think of it as another hidden treasure. I enjoy meeting new people; even grumpy people. It can be great fun to give them a fierce bear growl, and see how they like it when someone is grumpy to them. I meet all kinds of unusual people, but never someone quite as unusual as the man I met on this trip. He claimed that he was a “Knutty Knight”. I’m not at all convinced about the Knight part since I didn’t see a single piece of armour, but he certainly did seem to be more than a little Knutty. He was definitely my kind of person. I love my adventures, and meeting new friends, but sometimes I miss being with my old friends, and sharing their special times. The chance to share a special moment with a friend in spite of my travels, or even because of them, is the best kind of hidden treasure. Kobe provided one of those special moments. I was able to have new adventures, and share a very special day with one of my oldest friends. I was one of the few friends who could be there with him, which made the day even more special. You are probably quite confused by now, so I will explain. I’ve already mentioned that Bear School in Geneva had students from all around the world. Geneva is a very international city, with many people, and bears, from other countries visiting or living in the city. 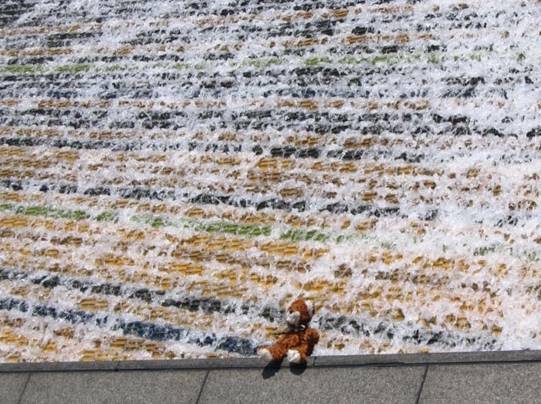 Most of the visiting bears return home when they leave Geneva, but some diplomat bears move to other countries. My best friend, Francisco, was originally from Brazil, but his family moved to Japan during my last year of Bear School. We kept in touch by writing letters, since bears don’t use email much, but we had not seen each other since he left Geneva. 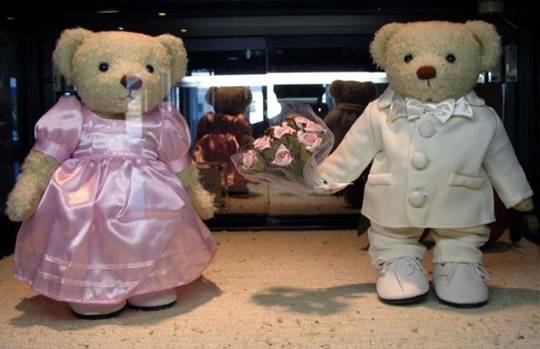 I was very surprised when he wrote to tell me that he had met a wonderful Japanese bear, and that they were going to be married. He said I was invited to the wedding, but since it was such a long trip, he would understand if I couldn’t make it. I was certain that I wouldn’t be able to go, and I was in a very glum mood for several days. Finally my traveling companion told me to cheer up, or tell him what the problem was. Rather gruffly, I told him that unless he was planning another trip to Japan, there was nothing he could do, and he should just leave me alone. He got this strange look on his face, and said that he actually was going on another trip to Japan. I wanted to get excited, but I was afraid it would be the wrong date, or the wrong city. Japan is smaller than Canada, but it is still a pretty big place. When he told me the trip was to Kobe in late April, I gave him the biggest bear hug of my life. A hidden treasure had fallen into my hands. That is how I attended my dearest friend Francisco’s wedding in Japan. He was very handsome dressed in his best suit, and his bride was beautiful in her wedding dress. They were quite busy preparing for the wedding, but we still managed to spend some time together. Francisco and I hadn’t seen each other in years, but by the end of the week the three of us were all great friends. I am looking forward to our next visit. 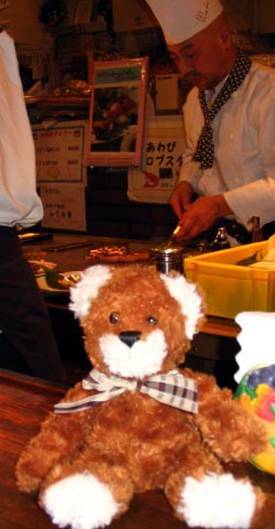 Francisco had made many friends in Japan. He had always been interested in getting to know people, just as I had been. Perhaps that is one of the reasons we became such good friends. 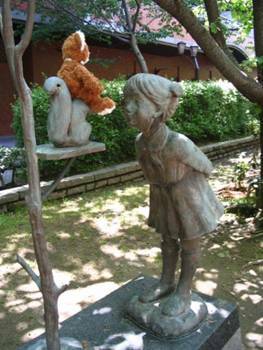 One of his closest friends in Japan was a young girl from his neighbourhood. She seemed very nice, but I don’t think she was completely comfortable around unfamiliar bears. I realized this after the wedding ceremony when a squirrel offered to give me a ride. The little girl came up to say hi, and surprised us. Both the squirrel and I sat very still, the way we often do around strangers. This surprised her, and so she stood very still too. For a moment, we all stood like statues, waiting for the other to move first. It was an awkward moment, but then I decided to shake her hand, and we all relaxed. We had a good laugh about that one later, I can tell you. I spent a lot of my time helping get ready for Francisco’s wedding, but I still had some time to explore Kobe and see some unusual sights. In Stittsville the leaves were just coming out on the trees but I was amazed to see that in Kobe the roses were already in bloom. They smelled wonderful, and I could see the bees buzzing around. It started me thinking about honey. I’m sure I would have found the hive if I’d been there a little longer. Oh well! 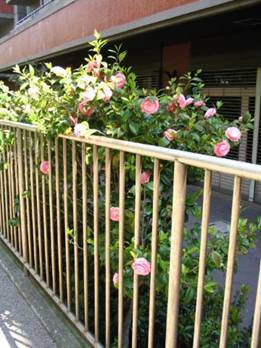 The roses weren’t the only interesting thing in Kobe. I also saw a very unusual waterfall. 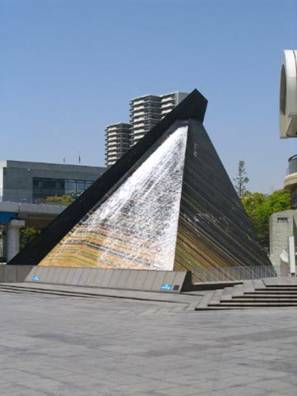 It was like a Pyramid with water running down the sides. Sometimes the water would completely stop, and you would just see the pyramid. Then a tiny trickle of water would start from the top. Slowly more water would appear, and the waterfall would get stronger and stronger, until finally it was like a torrent of water rushing down brightly coloured mountain rapids. It was one of the most amazing things I have ever seen, and I sat and watched it for a long while. On the last day, just before our flight, I went for one last look, and I saw something that was even more amazing. There was the waterfall, without a single person in sight. Japan is so crowded that the most amazing sight is to see no people at all. Of course, no adventure would be complete without trying some new food. When I told people that I was going to Kobe, everyone said I had to try the Kobe beef. I asked them what was so special about it, but no one seemed to know. All they said was that it was famous. This didn’t sound convincing to me. I like eating food because it has a wonderful taste, like raw fish, or melts in your mouth, like raw fish, or is really good for you, like raw fish. You’ve probably noticed by now that I love raw fish, but I love lots of other foods too. It’s just that I usually have a better reason than “it’s famous”. I had almost decided that I wasn’t going to bother trying it, until someone explained that it was also an unusual dining experience where you could watch the chef as he prepared your meal. In fact, the one who convinced me was that Nutty Knight – the one without a single piece of armour. In the end, I decided that maybe I’d give it a go after all. I must admit it was interesting, but it was strange too. The strangest bit was the pictures of famous people eating at the restaurant. One of them was Santa Claus, but he didn’t look like any Santa Claus that I’ve ever seen. I’m still not sure about that, but it certainly was unusual. 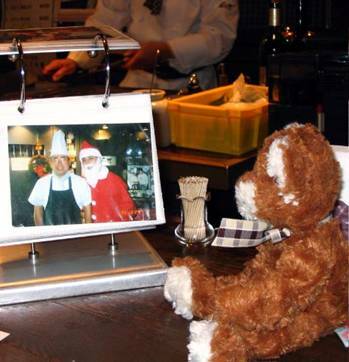 If the unusual pictures had been the only positive thing about Kobe beef, I would not have been impressed. In fact, I was sceptical right up to the moment I took that first bite. It was when my teeth sank into that first piece of beef, and the unbelievably rich flavour filled my mouth, that I finally understood why Kobe beef was so famous. It was divine. I really had no idea that cooked food could be that tender and that tasty. I was in heaven for the rest of the meal. As I was savouring the last bite, I was briefly jealous that Francisco is living in Kobe, and gets to have such wonderful food all the time. When I thought about it though, I decided that I really shouldn’t complain. I get to have my adventures. As so often happens, before I knew it the week was over, and it was time to head for home. I was sad, but contented at the same time. I’d been able to attend my best friend’s wedding, and still had time to discover an incredible food experience. It had been an unusual adventure, but when I think about it, almost all of my adventures are unusual in one way or another. The ride to the airport was uneventful, but when we got there, I was in for another surprise. I saw a special picture of a famous Japanese character who has travelled around the world bringing happiness to children everywhere. I feel a certain fondness for someone who loves to travel, and is loved by children everywhere. What can I say? 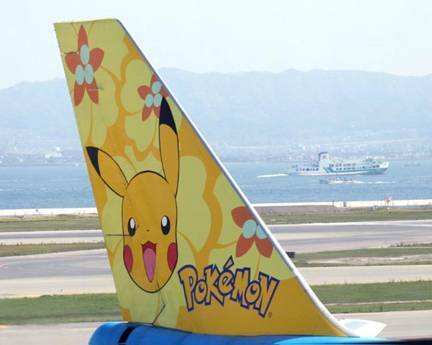 His name, in case you haven’t guessed, is Pokemon, and his picture was painted on one of the airplanes. It was a perfect end to a wonderful week in Japan. As the plane took off from Kobe I looked out the window at this wonderful place. 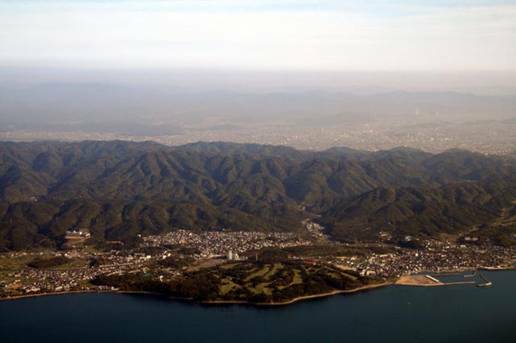 I was amazed to see the narrow strips of land between the mountains, where all the Japanese live. It truly is an amazing place. I find it amazing to see what travel does to the days. When you fly to Japan you go west, chasing the sun across the sky. It is daytime for the entire flight, which makes it a very long day. But on the way back, you fly east, and the night only lasts for a few hours. 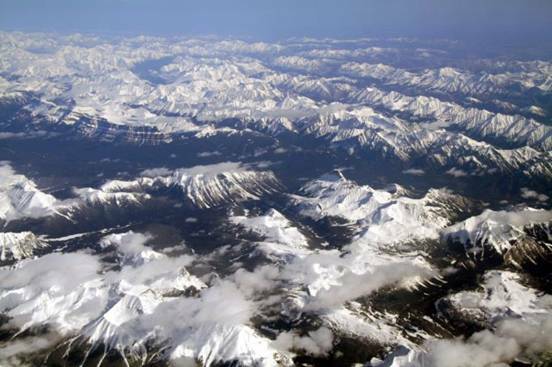 Before I knew it, I could see the mountains in northern Canada and Alaska. What a difference. Instead of the green mountains of Japan, with lush valleys between them, now there was nothing but snow covered mountains as far as the eye could see. The world certainly is an amazing place. I’ve been so fortunate to visit Japan twice in less than a year and being able to attend my good friend Francisco’s wedding was a real treat. I can hardly wait to see where my adventures will take me next, and what new wonders I might see.